SANTA FE, Texas (KTRK) — In the wake of the Santa Fe High School shooting that left 10 people dead and 13 more injured on May 18, people have come together in many positive ways to support the survivors, victims, and their families. As the community struggles to deal with the tragedy, a number of funds are providing assistance. Here’s a look at the GoFundMe verified campaigns. The foundation has currently met its food needs, for the time being, but is encouraging monetary donations to assist families directly impacted by Friday’s school shooting. A fund launched by Houston philanthropist Jim “Mattress Mack” Mcingvale and Gallery Furniture. Moms With a Mission is working directly with the Santa Fe ISD to distribute funds to families for upcoming expenses. Santa Fe High School alumnus Christy Smith Landriault is helping raise money for the Santa Fe Texas Education Foundation. The Houston Texans player has offered to pay for the victims of the tragic shooting funeral services. Gulf Coast Regional Blood Center has 17 donor centers available for donations everyday. Those interested will meet at Cabela’s at 2421 S. Gulf Freeway in League City on Sunday, June 3 at 10:30 a.m. There will be a meet-and-greet until 12 p.m. Participants will also go to the Galveston County Fair Grounds at 12:30 p.m. to join the BBQ Fundraiser. On Saturday, May 26, a barbecue benefit and bike ride will be held at the Galveston County Fair Grounds from 10 a.m. to 8 p.m. The address is #10 Jack Brooks Park, Hwy 6, Hitchcock, Texas 77563. 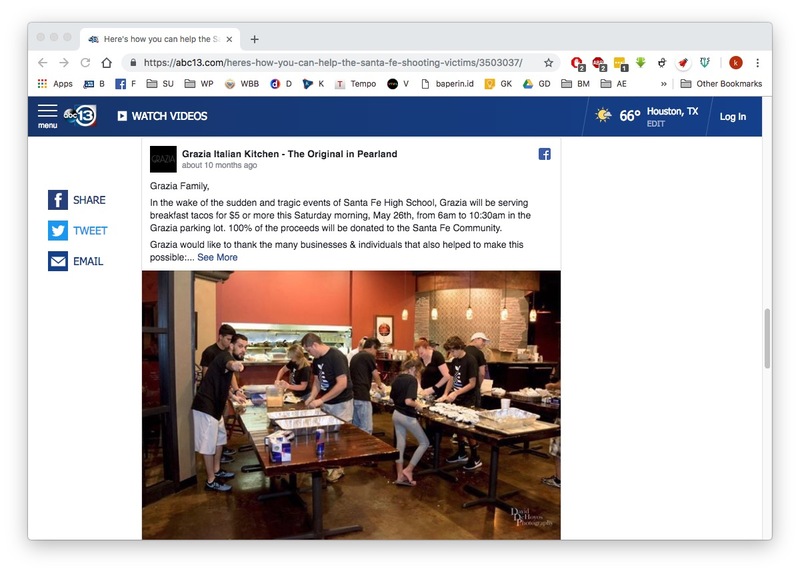 Grazia Italian Kitchen is donating 100 percent of their proceeds Saturday morning.